thegsaguy — . :: GSA SEO & Marketing Forum ::. 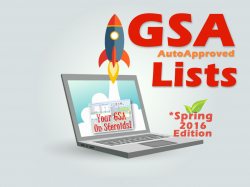 I Will Give You A Fresh Autoapproved Gsa List Of 600k Urls plus millions of URLs as bonuses - Updated Monthly This list is freshly built every month, using my own set of custom footprints and scraping techniques and I decided to give it here for a limited period of time because I don't want to get it saturated. The list will be sent in .sl and .txt format. Check The List Here.